CHANTILLY, VA. — The CSA Show at Chantilly will take place for 3 days from April 10-12, 2015. Friday Admission is FREE, Saturday $8, Sunday $8 or Weekend Pass $15. Former Pittsburgh Steelers halfback and current NFL commentator, Jerome Bettis, will be there to meet and greet fans and sign autographs on Saturday April 11, 2015 from 9am-5pm at the Dulles Expo Center located at 4320 Chantilly Shopping Center. Source: CSA Shows. 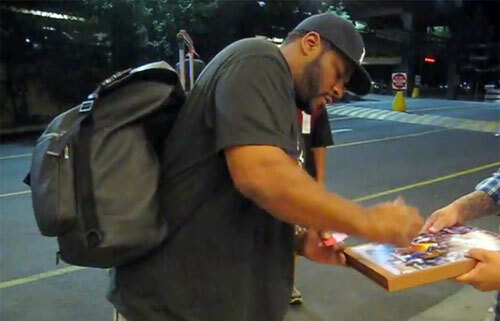 Photo shows Jerome Bettis signing autographs for the SI King July 16, 2014. Jerome Bettis, nicknamed “The Bus,” is a former NFL halfback who played for the St. Louis Rams and Pittsburgh Steelers. Bettis is sixth on the list of NFL rushing yards leaders. He retired in 2006 after the Steelers won Super Bowl XL in his native Detroit, Michigan. Bettis officially announced his retirement standing on the champions’ podium, holding the Vince Lombardi Trophy. Hines Ward, the MVP of the game, said during the Super Bowl commercial, “I’m going to Disney World and I’m taking The Bus!” Bettis is currently the host of The Jerome Bettis Show on WPXI-TV, filmed at Heinz Field in Pittsburgh, airing Saturdays at 7:00 PM and 1:00 AM. He is a commentator for the NFL Network and a former NBC studio analyst for Football Night in America. If you would like to book football speakers or professional athletes like Jerome Bettis for a speaking engagement, autograph signing, product endorsement, fundraiser or special event, contact Jerome Bettis’s booking agent for appearance and speaker fees at Sports Speakers 360. For booking agent and appearance fee information on how to book Pittsburgh Steelers players for appearances, call 1.855.303.5450.